Samsung has offered to remove some features from its Galaxy Tab 10.1 as it seeks to overturn a court-imposed sales ban in Australia. 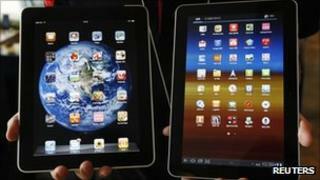 The ban on sales was sought by Apple which claims the tablet copies many of the iPad's patented features. Samsung has also reportedly made an offer to settle the dispute between the two firms so it can get on and launch the tablet in Australia. Apple said it needed time to consider the merit of Samsung's proposals. By removing and changing features Samsung is trying to end its wrangle with Apple outside the Sydney court overseeing the dispute. The two sides will return to court on 4 October. However, If Apple accepts the settlement offer the court case could halt and the Tab might be launched soon after. Apple sought the initial injunction to stop the launch of the Galaxy and then asked the court to rule on whether Samsung has violated its patents. The initial claim made by Apple mentioned 13 separate patents. However, Samsung has progressively taken out or altered functions to avoid infringing Apple's intellectual property. Now the dispute centres around only three patents. Samsung originally intended to launch the Galaxy tablet in Australia on 11 August. This was delayed by the injunction and was scheduled for 30 September. However, the ongoing court dispute has delayed it again. The legal row in Australia is one of many that Apple and Samsung have started around the world. They currently face each other in courts in the US, Germany and the Netherlands.